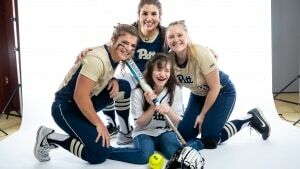 PITTSBURGH – The University of Pittsburgh softball team will be signing Team IMPACT recruit Rylee DiTullio Monday, Jan. 21 at 5:30 p.m. in the media room of the Petersen Events Center. The Panthers will be holding a Draft Day press conference to welcome Rylee to the team, where she will be joined at the podium by her parents, Lisa and Greg, as well as head coach Jodi Hermanek and senior Olivia Gray. Rylee, 16 years old, is a native of Mars, Pa. and attends Pine Richland High School. She was diagnosed with cerebral palsy as a child. Rylee has played baseball in the Miracle League for 10 years. She has two siblings, Joey and Dani, who both attend college at the Indiana University of Pennsylvania. It’s a big day in the ‘Burgh! We’ll be welcoming @GoTeamIMPACT recruit Rylee DiTullio to the team this afternoon! Take a behind-the-scenes look at her draft day experience on @NCAAsoftball‘s Instagram! Through Team IMPACT’s program at the University of Pittsburgh, Rylee will become an official member of the softball team. As a team member, she will attend Panthers practices, games, team dinners, events and more. Team IMPACT is a national nonprofit headquartered in Boston, Mass., that connects children facing serious or chronic illnesses with college athletic teams, forming life-long bonds and life-changing outcomes. Since 2011, Team IMPACT has matched nearly 1,700 children with more than 500 colleges and universities in 49 states, reaching over 50,000 participating student-athletes.